Content generously supplied by Clifford Quan (cliff@gene.com). My introduction to Saab automobiles began about 17 months ago when I drove a friend's 1986 900T SPG. It was different. I had always owned Japanese cars and the turbo on the Saab was surprising to say the least. He had somehow convinced me that if I was going to purchase a Saab that this was the one. It took me about four months of searching and looking at several '86 SPG's before I settled on one. They are hard to find but are out there and in various conditions. The car I purchased had some front end damage to the driver's side. The hood, grill, and front headlights('87>) were incorrect. The interior was in fantastic shape except for the usual cracked leather front seats. My friend checked out the engine and transmission and found the car to be essentially sound but in dire need of attention. My goal was to restore/repair the car to its near original condition. This is not a complete restoration. Since I had no history on the car I assumed everything needed to be done. The car had 163,000mi and VIN#YS3AD35L3G2016617. 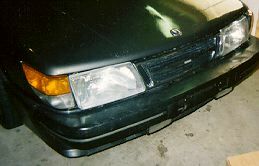 Figure 1: Poorly fitted hood, headlights, grill and side directional markers. The '86 SPG should have the headlight/light in bezel but someone tried to install '87> headlights and grill. For the first seven months the car was not driven during repairs. I began with the clutch and replaced it with the factory Saab Clutch Kit 900T (88 18 122), flywheel bearing, t/o bearing, rear engine main seal, clutch master cylinder, and clutch pedal/bushing. Since this was my first major repair I had assistance with this one. The most difficult part was disengaging the pressure plate. My friend had a spacer ring that was wedged between the fingers and housing of the pressure plate. He also had a homemade tool to hold the flywheel stationary. I also had to drain and remove my radiator. It was the original with slight damage and would need to be dealt with at a later time. Next came the replacement of the entire brake system. I installed front and rear rebuilt brake calipers, Brembo rotors, Metal Master brake pads, Girling brake master cylinder and Group6 stainless steel brake lines. I also installed new lock plates, caliper bolts, and rotor screws. Once the brake calipers were replaced and new U-clip/dampers installed the clunking noise when braking in reverse disappeared. Since the brake work was being done I was advised to do the suspension and installed the Saab RoadHandling Kit (02 74 589). This includes front/rear springs, gas shocks and lowers the car about 1.5". The kit is essentially a '87> SPG suspension. It is a good idea to install the front driver's side shock before the brake master cylinder. Once the brake master cylinder is installed its very difficult to get at the two 12mm lock nuts(special tools exist) that hold the top shock mount. Make sure you have a good spring compressor! Once you have the compressed spring out be careful removing the compressor. We laid a board over the compressed spring while releasing the tension on the spring compressors. I also installed a fresh set of NGK BCP7ES spark plugs, Bosch distributor cap/rotor, fuel filter, Bougicord wire set, Castrol 10W-30 oil and Saab oil filter, and replaced the transmission fluid with Redline MTL. The muffler(88 22 280) and tailpipe(75 35 925) were replaced with a stock Saab exhaust. 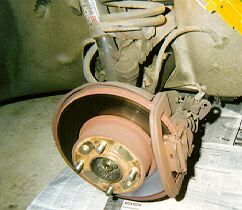 Figure 2: This is the passenger's side front brakes and suspension. 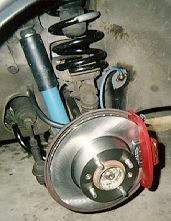 The Saab RoadHandling Kit includes shocks and springs. The calipers, rotors and brake pads were replaced along with the Group6 stainless brake lines . This is before the power steering rack, tie rod ends and ball joints were replaced.